Well here is another way to keep an eye on your green investment. The SunPower Solar iphone App lets you monitor how much energy your rooftop PV installation is producing at any given time. You can download the app from SunPower, or you can get it once you install your PV system. 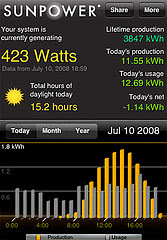 SunPower's new iPhone application makes it easy to monitor solar panel performance on the go, anywhere in the world. The application is just one part of the SunPower Monitoring System, which keeps track of SunPower solar panel performance with an in-home wall-mounted LCD display and an Internet-based program. This iphone app tracks a variety of statistical information notably, current solar panel generating capacity, lifetime panel production, today's production, today's usage, and today's net difference between production and usage. Of course, this app only works with SunPower mounted PV system and does not work with any other installation, but this is obviously part of the push to advertise and market their product. There are few other solar companies that are doing something similar, but with different information on their display. SMA America has developed an iphone app to monitor your PV system on the go. 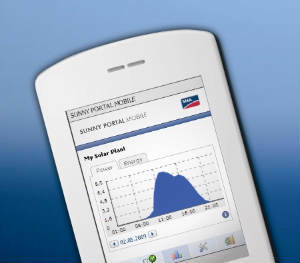 Developed by SunnyPortal, the Sunny Portal application provides a snapshot of any PV system. The application boasts a visual display of a system’s energy yield for the day, month, year and life-to-date of the system, in addition to listing its CO2 savings in tons per year. This data is uploaded daily via the SMA Sunny WebBox, a communication hub that continuously collects data from the solar inverters. This is not only for your rooftop PV system but this app also works for an entire solar power plant! Further more, GainSpan is developing iPhone applications to monitor and control home temperature, water heaters, HVAC, and lighting, and Visible Energy's UFO Power Strip is controlled by an iPhone app. My Opinion: This is another great way you can monitor the money you will be making with your solar panels on your rooftop, similar to watching your stocks. I don't think even the regular utility companies have an app like this, and even if they did, its kind of useless. I think it would make me feel good, especially when i see how much CO2 that i have saved just by installing solar panels on my rooftop. Bravo SunPower and other companies who are innovating new ways to monitor the energy we use!